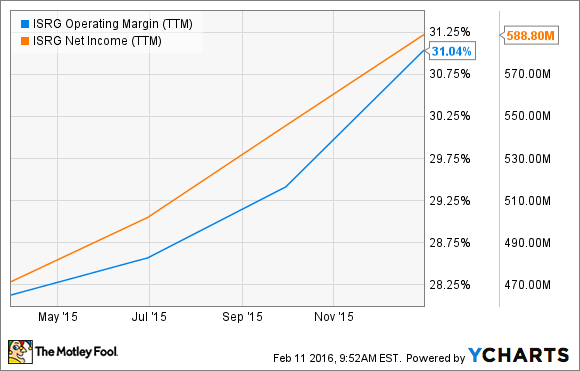 Here's why this small cap robotics company could be the target of M&A. Rumors are swirling that Johnson & Johnson (NYSE:JNJ), a major medtech company that's indicated it's hunting for deals, could acquire TransEnterix (NYSEMKT:TRXC), a tiny company working on robotic surgery systems led by Todd Pope, former global president of Cordis, which was once a J&J division. Although no one knows if J&J (or anyone else) will offer to buy TransEnterix, and rumors are usually a sure-fire way for investors to run into trouble, here are five charts that show why TransEnterix' acquisition rumors may have merit. The market for robotic surgery platforms is dominated by one incumbent: Intuitive Surgical (NASDAQ:ISRG). Intuitive Surgical's Da Vinci system has disrupted the surgical market, especially in prostate procedures, but if TransEnterix can compete on price and features, there could be a big opportunity for this upstart. Because TransEnterix won't have to elbow for market share against many competitors and its SurgiBot and ALF-X systems were designed to lower customer costs and overcome surgeons objections to robotic surgery, an acquirer with the right marketing team could put billions of dollars in Intuitive Surgical sales into play. Of course, billions of dollars in market opportunity only matters if there's an opportunity for meaningful shareholder-friendly profit. After all, competing in a market that's big and growing, but unprofitable, is a fool's errand because the company with the deepest pocket is likely to win (Amazon is a great example). Fortunately, as you can see in this next chart, the market for robotic surgical systems has proven to be very lucrative for Intuitive Surgical and that could mean that it will be similarly profitable for TransEnterix. TransEnterix could capture Intuitive Surgical's market share and Intuitive Surgical's profitability suggests that this is a bottom-line friendly business, but what could make this industry really compelling to an acquirer is its future growth trajectory. Despite headway that's already been made by Intuitive Surgical, robotic surgery still only represents a single digit percentage of surgeries performed in the U.S. and EU and because of that, industry watchers think the surgical robotics market could soar from about $2 billion in 2014 to more than $10 billion in 2021. If so, that would work out to about 25% compounded annual growth! Often, acquirers balk at buying if a company is on shaky financial ground or if investors have already bid the stock price up to untenable levels. However, that doesn't appear to be the case for TransEnterix. TransEnterix has about $53 million in cash on its books and it has less than $20 million in debt. The company's current ratio, which gives investors a quick and dirty look at a company's ability to make good on its short-term financial obligations, is a healthy 4.03. 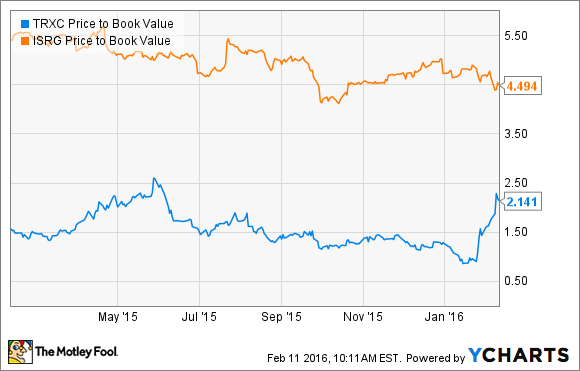 Also, while shares have run up on rumors, the company's book value is $1.93 and that means its price-to-book ratio is 2.19. That's not ridiculously high for a company that's only now emerging, and it's less than half Intuitive Surgical's 4.54 price-to-book ratio. An acquirer has to be patient if it has to wait around for an acquisition to pay off. However, TransEnterix products should hit the market soon and that means that an acquirer's potential to capitalize on eventual sales and profit is coming up quickly. TransEnterix will begin marketing its ALF-X multiport system in countries accepting the CE Mark of approval (Europe) this year and ALF-X may find willing buyers because its ability to reuse instruments could give it a per procedure cost advantage over Intuitive Surgical. Additionally, TransEnterix hopes to land an FDA approval to begin marketing SurgiBot this year too. If approved, a $500,000 price that's 75% lower than the price of the Da Vinci system could allow TransEnterix to make inroads with small hospitals operating with tighter purse strings. According to TransEnterix, the vast majority of the thousands of small hospitals in the U.S. haven't yet embraced robotic surgery because of its cost. Previously, Johnson & Johnson announced a deal with Verily (formerly Google Life Sciences) to create their own surgical robotic systems, so there's a chance J&J is happy to go on its own, rather than do a deal. Another acquirer for TransEnterix could emerge, but its probably best not to buy TransEnterix stock based on M&A hopes. Instead, investors willing to take the risk of TransEnterix failing should buy shares because TransEnterix could conceivably become a leader in what is a disruptive, growing, and profitable industry.